Welcome to your one-stop resource for all things Dyer Real Estate! To learn more about Dyer properties, call our real estate specialists at Jana Caudill Team today. Meyer’s Castle was built by noted Herbalist Joseph E. Meyer in the style of Jacobethan Revival Architecture between 1929 and 1931. Numerous emu and peacocks live on the grounds which feature a magnificent garden, swan pond, and waterfall. Meyer’s castle is perfect for weddings and corporate meetings. Gino’s Steak House is always a great place for a great meal and has been voted best steaks in the Northwest Indiana region many times over. Dyer is home to quite an extensive park system. Among 22 locations town-wide, notable parks include Northgate Community Park, featuring playground equipment, numerous baseball and softball diamonds, horseshoe pits, snow sledding hill, tennis courts, soccer fields, and grass volleyball courts. Pheasant Hills Park offers many of the amenities featured at Northgate, including a skate park and a hiking trail around the parks pond. Briar Ridge Country Club offers 27 championship caliber golf holes plus a full menu of other club amenities including tennis facilities and pro shop, Olympic size swimming pool, and fine dining and entertainment. According to City-Data.com the median household income for Dyer homes from a 2016 study shows an income of $82,299 compared to $52,314 for all of Indiana. 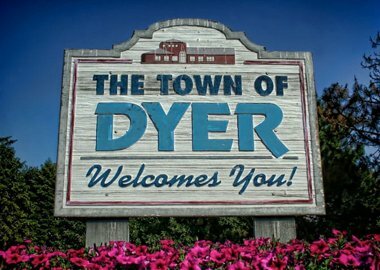 Median home values for Dyer in the same time frame were $205,706 compared to $134,800 for the rest of the state. For current, up to date information on homes for sale in Dyer visit these links or contact our office to set up an appointment. The Franciscan St. Margaret Health Center is located in Dyer at 24 Joliet Street. Other hospitals and medical centers near Dyer include the Community Hospital, the Franciscan Physicians Hospital, and the Surgical Hospital of Munster, all three located in Munster, Indiana. Dyer has an Amtrak station on Sheffield Drive. Notable colleges and universities located near Dyer include Purdue University Northwest in Hammond; Prairie State College in Chicago Heights, Illinois; South Suburban College in South Holland, Illinois; Indiana University-Northwest in Gary; Ivy Tech Community College-Northwest, also in Gary; City Colleges of Chicago-Olive-Harvey College in Chicago, Illinois; Chicago State University, also in Chicago. Whether you have a question on buying a home in Dyer, selling a home, or any other Dyer, Indiana Real Estate question please call or email us. We’re always happy to help!